Meanwhile in a remote Polish village of Balham, the locals have gathered for an annualOpłatek Parafialny (lit. the parish Christmas wafer), the ritualistic breaking and sharing of Christmas wafer. 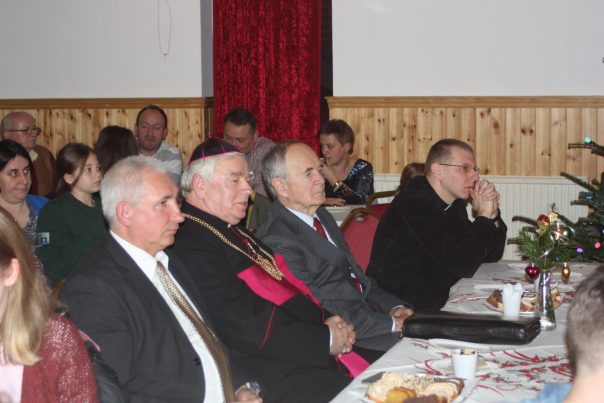 The tradition is sacrosanct in Poland proper and all its overseas outposts. It consists of sharing a piece of white wafer, closely resemebling communion wafer in Catholic church, with one’s nearest and dearest, whilst at the same time exchanging lengthy elaborate Christmas wishes. It takes place on the 24th of December, during traditional 12-courses Christmas Eve supper, a Polish national institution, known as Wigilia. Non-Poles who try to imitate this custom with just a cheery Merry Christmas miss the point of reciting a list of well thought through and personalised wishes, enumerating all the ills to be remedied and specific aspects of prosperity that we wish the Christmas season to bestow on the recipient of our tiny piece of wafer. I digress. 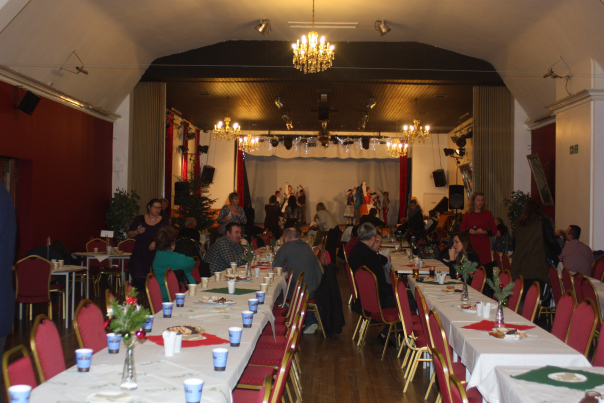 Balham White Eagle Polish Club has been hosting the Opłatek event since time immemorial, or at least since the Polish settlement in Balham took hold some decades ago. The ritual is observed according to a reassuringly predictable protocol. This might seem chaotic even brusque to outsiders, but Polish Balhamites find comfort in the proceedings. To begin with, the Chairman of the Parish welcomes everybody in the room. A panel of parish priests bow majestically. The hand movements are uncannily royal. First artistic offering of the evening is traditionally provided by the parish choir. 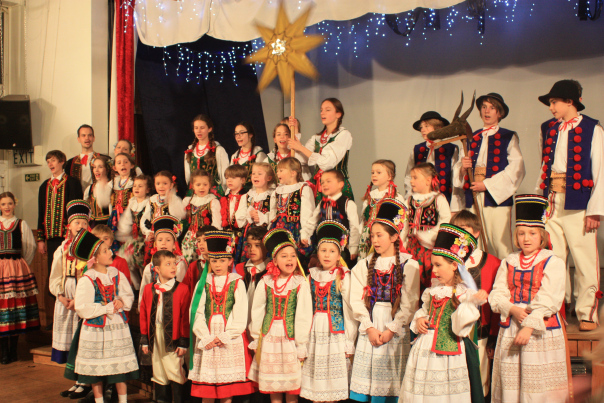 A group of around 15 mostly female, very smartly dressed singers in white blouses and floor length black skirts, all with matching glittery necklaces, take over the stage and deliver a series of traditional Polish Christmas carols. Feliz Navidad it ain’t. Operatic tones and solemn melancholy songs set the mood. This can be dangerously sleep-inducing to uninitiated outsiders, and looking around I notice some of the 200-strong audience in semi-slumber. As for the Poles in the room, the familiar Christmas music from their church-going childhood seems to be doing the trick as they are gently carried back to memories of motherland. Warm fuzzy feeling spreads slowly around the room. Foundations are laid for the main event of the evening. 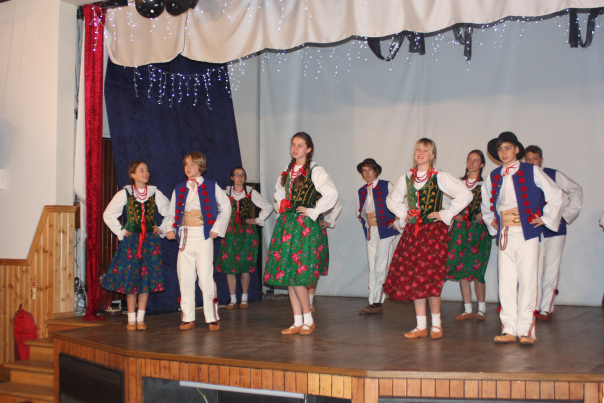 The next hour or so belongs to folk dance groups Lajkonik and Orlęta. They are divided into four age groups, ranging from adoringly clumsy 4 year-olds to professionally looking dancers in their mid to late 20s. They are all simply amazing. Basia Klimas-Sawyer, who has been running the groups for 42 years now, is a household name in Polish Balham and a true national treasure. 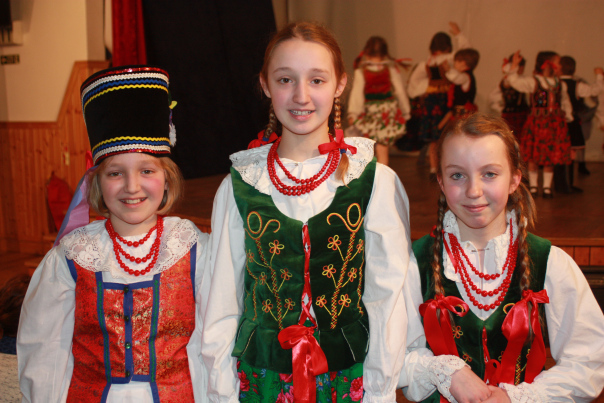 Generation upon generation of Polish dancers in London owe their adventure with Polish folklore to her. She has to be seen to be believed. After the show, the parish priest takes centre stage, says a few seasonal words, sprinkles holy water on the Christmas wafers and off we go, sharing the wafers with friends in the room, exchanging wishes and three kisses on the cheeks. Tea and coffee is served, as well as a selection of slightly tired looking cakes; a gift from the chairman of the parish, who happens to own a successful Polish bakery. A couple of hours later we suffer from a serious case of Polishness overload. Still, we say our do widzenias safe in the knowledge that in less than three months we’ll meet again atŚwięcone (the blessing of the Easter food basket) gathering. This time we will be sharing hard-boiled egg quarters. Same place, same crowd, same dancing routines. I shall keep you posted. In front row, the Balham high and mighty. Oh, and father Karol, far right.